Today's daily (until Christmas day) painting is an especially touching one and a favorite of mine. 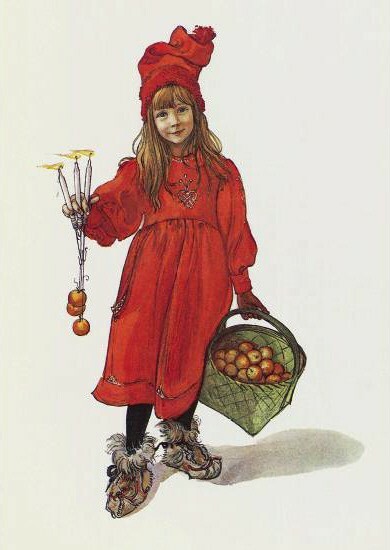 A smiling child dressed in Christmas red, the daughter - I believe - of Swedish painter Carl Larsson (1853 - 1919), she personifies the joy of the season. Her name is Brita and she's happily holding some candles and a basket of those little apples whose name I forget. For more on Carl Larsson and his work, please check this link. Hi, Yvette - I've been charmed by every one of Carl Larsson's paintings, and as I look at the many, many representations of his children, I sometimes wonder what sort of lives they lead. Certainly, they appear to have had idyllic childhoods. Well, appearances can be deceiving, but I'll bet they did have a great childhood. They certainly lived in an idyllic looking house - the outside painted bright red. Have you seen the photos of the house, Mark? It's still there and open for tours and such. Larsson believed in bright colors and you find them all over the house as shown in his paintings. We can always count on your impeccable taste in art, Yvette. I love this one too. And I just adore your Christmas banner! Too many of us can totally relate! Merry Christmas, Yvette! Thanks, Becky! And a Merry Christmas to you and your family. I love the colors of this one for some reason.... I can't stop looking at her. It's a gorgeous painting, Ryan. Very Christmasy.